I was inspired by my love of Zelda games for this dish – great for my son’s Nintendo themed birthday party! Take a pack of cheap and cheerful chicken wings, pour over your favourite barbeque sauce, sprinkle some sesame seeds over and pop in a moderate oven for about half an hour until the chicken is cooked through and the sauce is sticky. 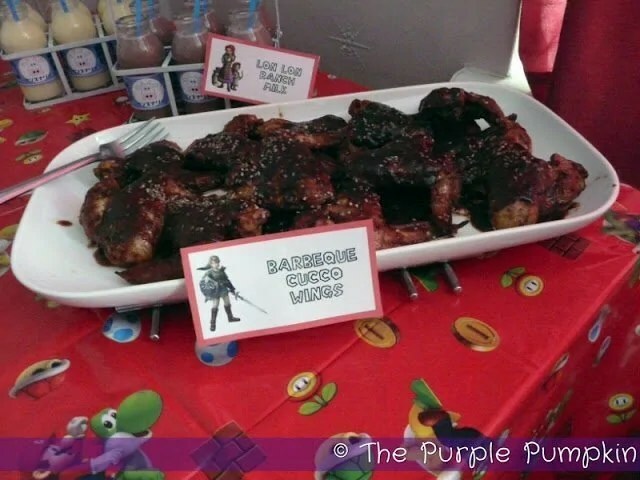 Here you have it…Barbeque Cucco Wings! Cuccos are chicken like birds that run around Hyrule, helping Link to float over gaps when he holds one above his head, or attacking him if he gets too wayward with his sword! Yeah, I got a kick of it! Knowing how the cuccos are in the Zelda games!! COOL!!! And Creative! Hope it was fun! :) lol Kakariko Fried Cucco!